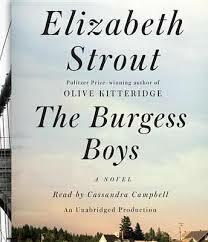 A nice enough cover with Strout’s name front and center probably because of “Olive Kitteridge” which won the Pulitzer Prize in Fiction 2009, and was a finalist for the 2008 National Book Critics Circle Award. I read and thoroughly enjoyed that collection of stories, probably in 2008 or ’09 when I wasn’t blogging. The Burgess Boys: A Novel is apparently NOT a “collection of interrelated stories,” but a real novel. I see by the table of contents that it comes divided into a Prologue and then 4 Books each of which has between 8 and 12 chapters. Prologue – 1st person narrator/author of the book, perhaps imaginary, is talking to her mother about a family they both know – the Burgess family. The Burgesses seem to have had a difficult life – years ago, one very young son accidentally drove over his father killing him. Their mom did the best she could with the children; James grew up to be a pricey lawyer married to the snobby Helen, Bob turns out to be a bit of a “mental case,” and Susan has problems being a divorced mom with a difficult only child. The Prologue ends with the protagonist deciding to write about the Burgess boys – a little metafiction there – perhaps. Why is this Prologue there? To add authenticity to the story to come? To give some background on the characters we are to meet? I think yes- but it also gives a few spoilers – which can’t really be considered spoilers since the author has chosen to reveal them at this point. I guess we are supposed to remember that Bobby ends up married to the Unitarian minister and that feels good later. I don’t always appreciate prologues because they’re often used to jump-start a story with a moment of drama. In this case the Prologue works nicely because the later story doesn’t have to be interrupted for the material which is here – and it’s vital material. Also, I think perhaps the last sentence, “Nobody ever knows anyone,” might be a theme. We find out that at the age of 4 Bobby accidentally let out the clutch and the car rolled down the driveway hill killing his father. This brought a whole lot of life-long consequences to the lives of the the family. Moving on into Chapter 1 where the Burgess children are now middle-aged and James and Helen are packing for a resort vacation with his boss and wife. A phone call from Susan Olson, Bob’s twin, reveals that Zack, Susan’s son, has thrown a frozen pig’s head into a Muslim mosque creating a bloody mess on the floor. He needs a lawyer. Yes. It seems the small Maine town has been inundated with an influx of immigrant Somalis and this will likely be prosecuted as a “hate crime.” Turns out none of the Burgesses is real tightly wrapped but Jim seems very practical, Bobby very soft hearted, and Susan somewhat bitter. Jim and Helen leave on vacation, Bobby goes to Maine where he stays with Susan and they bring Zack into the police station. Later Bobby accidentally drives a bit close to a Somali woman who threatens him with legal action – but likely won’t do anything. A Somali named Abdikaram Ahmed, along with his extended Somali-Muslim family, makes an appearance in a short but revealing section about mid-way through this first book of the novel. He is disturbed by the laughter of the policemen who investigated the pig’s head. He is separated from his wife and children because they moved away before he arrived in Maine. Margaret Estaver (from the Prologue) knows and supports the family. Book 2 – Bobby is back in New York and goes to lunch with his ex-wife, Pam. The only reason they’re not married is because Bobby can’t have children and she wanted them badly. Pam is still in his life, his best and oldest friend, a threat to new relationships for Bobby. And then Susan calls with the news that there has been a press conference and it looks like Zack will be prosecuted. But Bobby feels safe in New York – he peeps in windows which are viewable from his. He thought of all the people in the world who felt they’d been saved by a city. He was one of them. Whatever darkness leaked its way in, there were always lights on in different windows here, each light like a gentle touch on his shoulder saying, Whatever is happening, Bob Burgess, you are never alone. Abdikaram is still bothered by the events at the mosque – the mosque still stinks, no one called the Somalis to the press conference, and the perpetrator is back to work at Walmart. His sister wants him to move back to Somaliland because they’ve heard the news there and fear for his safety. But Abdikaram is the owner of a small coffee shop and can’t just up and leave it all. There’s a great deal of fear in the Somali community due to language and customs and so on. The same holds true of the white community. And Abdikaram hears the news of his homeland – it’s not promising. He hears about community reaction. Susan meanwhile, is concerned about the charges and we get some background on Pam and her relationship with Bob and the family – offering more insights into the sibling dynamics as well as Barbara Burgess, the mother. Pam herself is more of a homey person than any of the other characters. Bob – lonely, totally insecure, feels bad about himself, but is the most likable of the bunch – needs people and a psychologist and cigarettes and booze. Jim- smart, good-looking, proud, over-achiever, angry, feels some guilt for having achieved so much – the “dad” of the family after Mr. Burgess is killed. Loves his family deeply. Helen – married to Jim, a sort of snob with a soft-spot for Bob, lives in a kind of dream world, emotionally distanced. Pam – a motherly type still in love with Bob, her ex-, but married to someone else – a “sister” to Bob? Changeable. These characters are all fragile – even Mrs. Drinkwater, Susan’s tenant, gets a little interior piece – she’s stable but deeply sad. The Unitarian Minister might be strong and she’s pretty much an unknown quantity for most of the book – she’s been married twice. And the plot takes off, the twists begin – we think we know these characters – Strout is good – but then they do something somewhat different. But is it what it seems – are the characters stable and transparent, or are there hidden desires and old needs just waiting for some trigger or stress point to release them? Strout keeps juggling the character-based threads through the plot driven book – but as the plot gets tighter, the characters seem to unwind creating a certain amount of character-driven action – which, in this case, drives the plot some more. Will Zack be prosecuted for all he could be – what will happen to these fragile members of his family? If Jim pulls a power-play will that make things worse for Zak in the courts? If Zack is found guilty what will that do to him and his mother? What are the repercussions? How well do we know these characters? And Jim does make the power play and Zak’s case is is found guilty of the local and state charges and Abdikaram sees the sad, scared “child” on the stand. And then the Federal charges come through.